NYPD to create new unit to investigate police-involved shootings, motivated by death of Eric Garner. 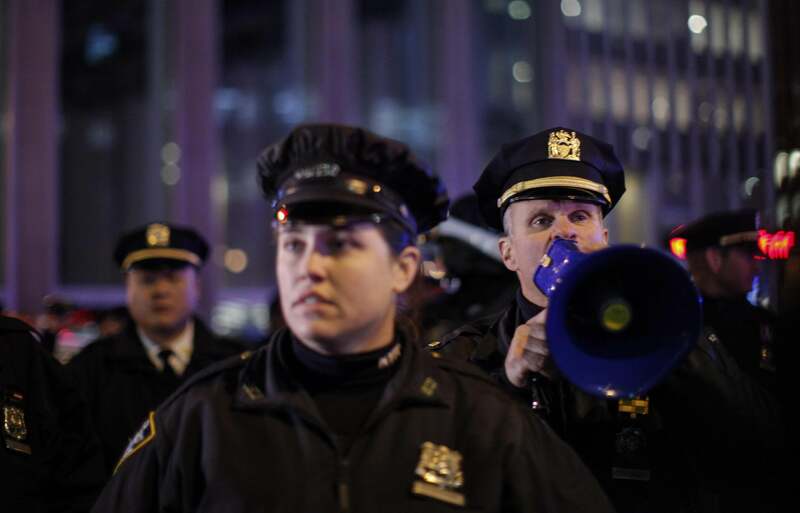 NYPD officers at a protest in the wake of Eric Garner’s death. The NYPD is creating a unit that will investigate police-involved shootings, reports the Staten Island Advance. The plan, hatched by Commissioner Bill Bratton, was apparently inspired by a similar division of the Los Angeles Police Department that was created in 2001, just before Bratton took over as its commissioner, to look into any and all incidents involving an officer using deadly or injurious force. The creation of the unit in New York was precipitated by the death of Eric Garner at the hands of an officer trying to arrest him for selling loose cigarettes. Garner’s death last July motivated Bratton to send a team of officers to L.A. to see how the department there deals with use-of-force incidents. For a detailed look into how the LAPD Force Investigation Division works, take a look at this article at PoliceOne.com, where Kris Pitcher, its former captain, describes the process.